In 1866, Peter Baxter's misfortune ends the day he leaves Badgerys Creek orphanage. Unsure of what to do next, Peter finds himself on a farm run by Mr. Brown. An aging man, Brown needs help and is happy to give Peter a place to live in exchange for his labor. Unbeknownst to Peter, Brown's past is riddled with dark secrets tied to the same orphanage, which he has documented in a red folder. During a chance encounter, Peter meets Rose. Peter cannot help but fall in love with her beauty, grace, and wit but fears that his affection will go unrequited as a result of his crippling poverty. But fate changes when Peter joins the search for gold in Hill End, New South Wales. Striking it rich, he returns to Rose a wealthy man. Peter is changed by his new found affluence, heading towards the mire of greed. Will Rose regret her relationship with Peter? Meanwhile, Rose has her own troubled history. One that is deeply entwined with Brown's past and Peter's future. 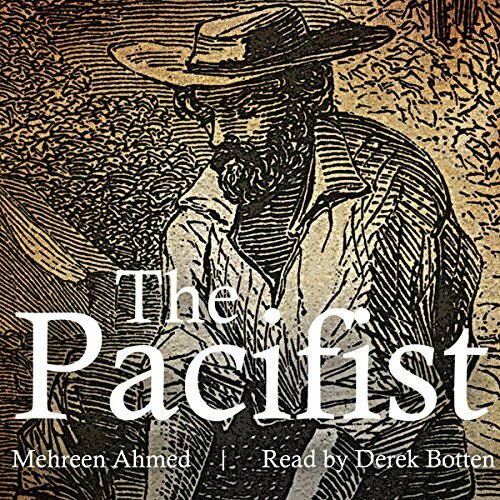 In 'The Pacifist,' Mehreen Ahmed has crafted a complex and beautifully nuanced tale of love, deception, institutional abuse, and familial woe. The story follows the lives of three generations of an Australian family during the late 1800s, all of whom were in some way touched by the corrupt and abusive Badgerys Creek orphanage. The tale also touches on the societal effects of sudden wealth, and the cruel history of Britain’s Australian colonies. Written in a style reminiscent of literary great Joyce Carol Oates, 'The Pacifist' is a must-read for lovers of historical fiction and Australian history. If you could sum up The Pacifist in three words, what would they be? That the reason for Marcus' attitude is revealed and it makes you go back and listen to the first few chapters again. When Marcus went down to the beach and took a nightly swim. If you could take any character from The Pacifist out to dinner, who would it be and why? Mr. Brown, so I could get more details on him and Rose. I got this book via audiobook boom and this is my voluntary review. The narrator was perfect for this story. He evoked the emotions required for each scene and he spoke with the right tone that carried the story along.